Before the internet there was and remains, the oral tradition of sharing knowledge, wisdom, and history through the spoken word. Acclaimed visual artist, Derrick Adams’ new solo project THE HOLDOUT taps into that tradition and combines it with digital technology through a large pyramid-like sculpture housing an online radio station, organized by curator Dexter Wimberly. The structure, suspended from the ceiling of Newark’s Aljira A Center for Contemporary Art, provides an interactive space featuring live DJ broadcasts, spoken word performances, and discussions about topics from music of the African diaspora to LGBT rights. Building on the theme are photographs and sculptures from Adams’ ongoing series Welcome to Monument City. 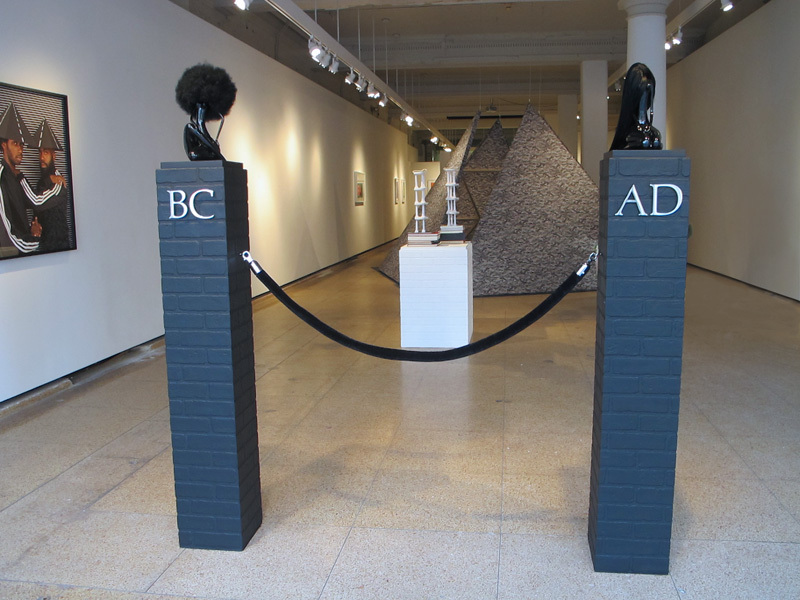 At the end of the exhibition’s run on April 25, Adams plans to dismantle the installation and make fragments from the pyramid available for sale to further support Aljira’s mission of providing a space for artists to engage the community. Soul singer, Syleena Johnson didn’t have to go too far to find material for her TV-movie musical debut, Couples Therapy, which premieres on BET this Monday, March 30 at 8pm EST. Her recent album Chapter 6: Couples Therapyprovides the soundtrack and story structure with songs documenting the trials and tribulations of a relationship. And for one of the movie’s major plot twists she allowed director, Tangie B. Moore to pull from her sister and manager, Dr. Syleecia Thompson’s stillbirth experience. Although she is known more for her music than acting, Johnson revealed that the latter was always a passion. She recalled being younger writing scripts and plays and studying theater throughout her high school and college years. For her the movie musical represents a dream come true that she also gets to share with collaborators from her album, who co-star in the production including Leela James, Dave Hollister, and Willie Taylor.